For a couple years I’ve been slowly adding to my liquor cabinet, and then recently I’ve just gone nutso and been buying carts full of stuff to try. Unfortunately this means that the tidy little nook that was housing all the liquor is now being turned back into the wine rack it really is. The sideboard is now starting to groan under the weight until we get around to finishing the bar (and with a now tentative plan of late January for this year’s Tiki Party, that really needs to happen ASAP). While cleaning out the wine nook, I came across a couple bottles that have not seen the light of day for quite some time. One being an ‘ok’ bottle of Amaretto. I believe this was bought around the time of the first Tiki Party four years ago, and hasn’t been cracked open since this post. Needless to say it was quite dusty. I figured it was time to give it a second chance when it occurred to me… what to do with a bottle of Amaretto? An Amaretto Sour? I don’t think I’d even tried one before. And while I wasn’t about to compete with Mr. Morgenthaler on how to make one (who can while he is making that face?… I kid, I’m sure it’s delicious.) I wanted to just make it as basic as possible and to just try it on for size. Just two ingredients. And in the end, head-scratchingly good. I guess I’d forgotten how much I enjoy the taste of almonds. That is, after all, the defining characteristic of Amaretto. Mixing it with lemon made it one of the most delicious, almond-spiked (albeit maybe the only almond-spiked) lemon-aides I’ve ever had. I was very surprised with how much I enjoyed the drink. The sharp lemon was cut perfectly with the overly sweet amaretto, omitting the need for sweetener entirely and blending just two ingredients into a well-balanced cocktail. I could see this working at brunch. Add liquids to a shaker 1/2 filled with ice. 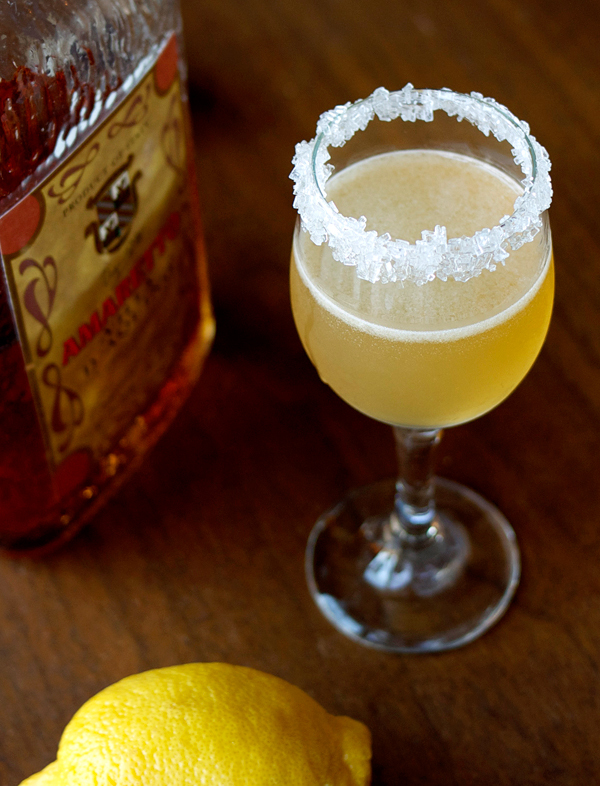 Shake and strain into a sour glass garnished with a sugar rim. Note on the sugar rim: while pretty to look at, completely covering the entire rim resulted in WAY too much sugar. I’d suggest half the rim dipped in sugar, or just leave it off completely if you’re by yourself and don’t feel the need to garnish. I also did one take with a slight dusting of nutmeg. It gave the whole drink a lovely woodsy aroma and I found it enhanced the almond flavor; add if you want to get fancy like that.